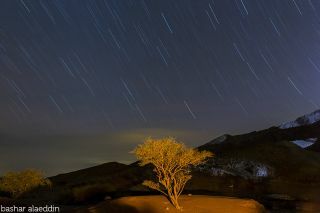 Skywatcher Bashar Alaeddin took this image of star trails over Feynan Valley near Petra in Jordan in Dec. 2012. He used a Canon 5D Mark III camera with a 24mm f/1.4 lens, settings set at 24mm, and f/8, ISO 320 for 1200 seconds. Stars appear to fall like rain over Jordan in this dazzling night sky photo. Skywatcher Bashar Alaeddin was trying to capture images of the Geminid meteor shower when he took this spectacular photo in Feynan Valley near Jordan's historical city of Petra in December 2012. "The sky was partly cloudy and although I did see quite a few meteors, I wasn't able to capture them on camera for the mere fact I didn't know where to aim the camera and it was my first time trying to capture meteors," Alaeddin told SPACE.com in an email. Alaeddin used a Canon 5D Mark III camera with a 24mm f/1.4 lens, settings set at 24mm, and f/8, with ISO 320 for 1,200 seconds. The natural rotation of the Earth and a long exposure on the camera created the image of star trails. Editor's note: If you have an amazing night sky you'd like to share for a possible story or image gallery, please contact managing editor Tariq Malik at spacephotos@space.com.